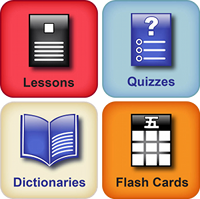 TenguGo provides first-class Android, iOS and Online language materials, including lessons, interactive quizzes, flashcards, spoken audio, and in-depth dictionaries, for the motivated self learner. Our goal is to develop a full suite of digital tools to help you learn and master a language without the high costs of traditional textbooks, materials, or classroom fees. We currently offer learning materials for Japanese, Arabic, Korean, Russian and Hindi. With over 10,000 reviews our apps have an average rating of 4.8 stars!